2. The loss in velocity due to the initial compression of the driving spring is equal to F«t/Mr. Determine the velocity loss for various values of t, subtract each from the corresponding ordinate of the free bolt velocity curve and draw a curve through the resulting points. If the effect of the spring rate proves to be negligible, this curve is the retarded velocity curve. 3. Integrate under the curve drawn in step 2 to obtain the displacement curve. 4. Assume that the curve drawn in step 3 represents lhe actual bolt displacement curve and use this curve to determine the retardation due to the spring rate K. Ordinarily, it will be found that this retardation is so small that it will not have any effect worthy of consideration. curve drawn in step 2, and then integrate tinder the new curve to obtain a corrected displacement curve. fi. Steps 4 and 5 can be repeated as often as is necessary until no significant change occurs in the displacement curve. Actually, this process of successive approximation should never be necessary and satisfactory results should be achieved in the first three steps or at least in the first five steps. 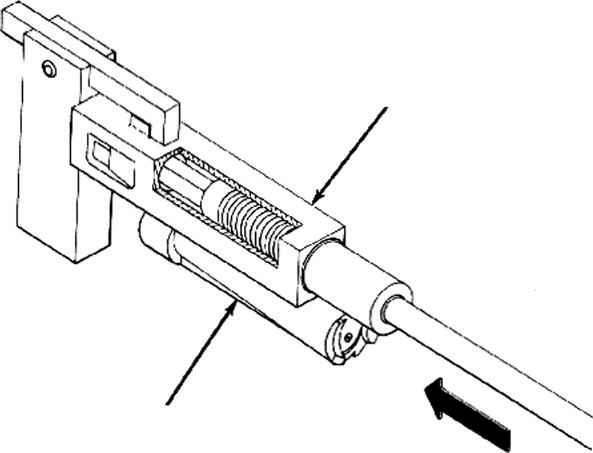 The loss due to K, as determined by the method of step 4 is only about 0.0004 feet per second. Thus, in this gun the retarded velocity curve for the first 0.010 second is practically identical with the free velocity curve. Figure 1-17. Time-Travel and Time-Velocity Curves (Complete Cycle). This equation is employed to complete the bolt displacement curve. The orclinates of the displacement curve are then multiplied by K and increased by F0 to obtain a curve showing the variation of the total spring force with time. Integrating under this curve and dividing by Mr in accordance with equation 1-15 will give a graph of the loss in velocity due to the spring force. 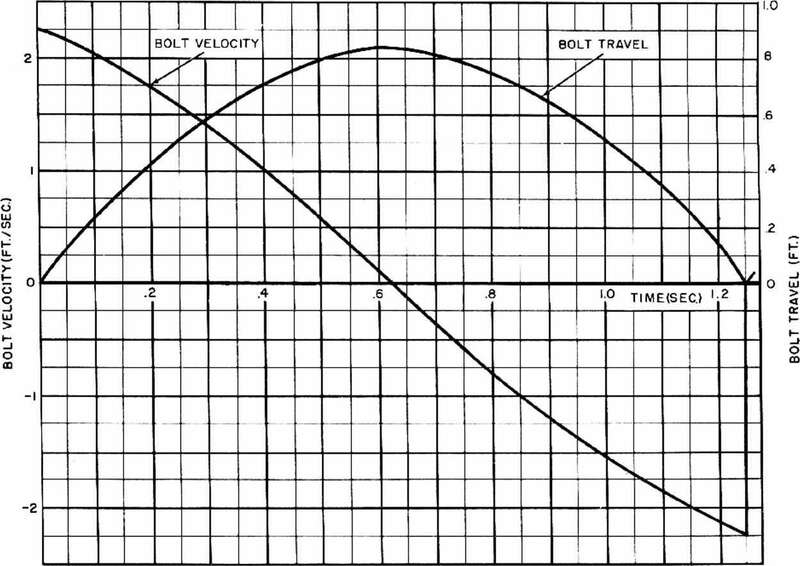 Subtracting this curve from the free bolt velocity curve will give the complete graph for the retarded bolt velocity. The spring force curve obtained from the displacement curve of fig. 1-17 is shown in fig. 1-18. Figure 1-18. Variation of Spring Force With Time.